America’s Freshest Ice Cream® is kicking off ice cream season by celebrating their annual Free Cone Day next Thursday, April 27, from 3-8 p.m. Guests who visit participating shoppes will be treated to a FREE junior soft ice cream cone filled with their choice of freshly made vanilla, chocolate or Cookie Butter – Carvel’s newest, limited-time flavor, inspired by the irresistibly creamy, spreadable treat from Lotus Biscoff®. As if getting FREE ice cream doesn’t feel good enough, Carvel is partnering for the sixth year with The American Red Cross to spread good will in support of the charity’s annual Giving Day. While supplies last, Carvel will offer a $1 coupon book worth more than $20 in Carvel savings, with all proceeds contributing to Carvel’s donation to the American Red Cross. 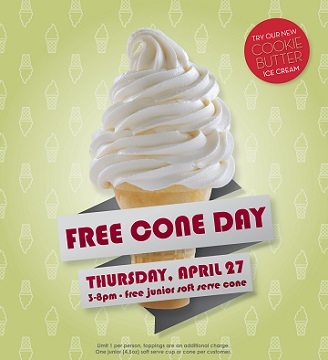 Carvel’s Free Cone Day is Thursday, April 27, from 3-8 p.m., benefiting the American Red Cross! Next post Krystal: Free Slushie or Frost!